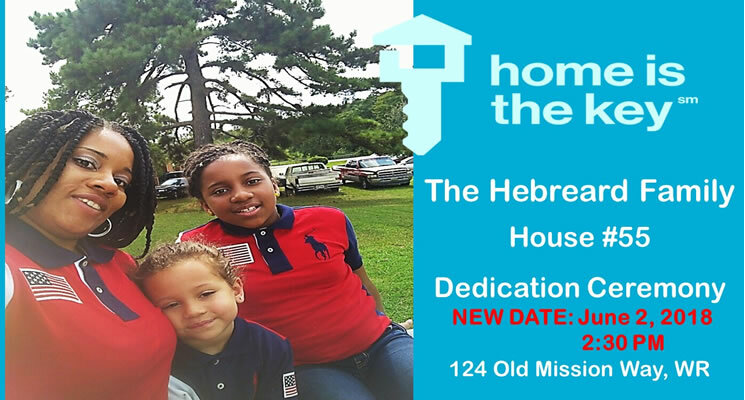 Charlette Hebreard recently qualified for housing with Houston County Habitat for Humanity. She is a hard-working mother of two with a compelling story. She currently works as a hairdresser. She just finished achieving her CNA certification and volunteers her time with hospice. She is currently enrolled in school part-time studying phlebotomy. Charlette has experienced hard times, but is keeping a positive attitude. 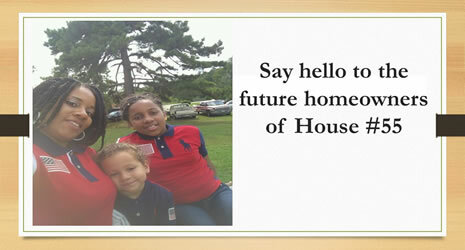 She has been seeking strength, stability and self-reliance through affordable shelter. She is very grateful and excited for the opportunity to offer her beautiful children better living conditions and quality of life through her partnership with Habitat for Humanity. Below is Charlette's story in her own words. "My name is Charlette Hebreard and I'm 27 years of age. I'm a single mother of 2 and working and going to school and managing bills and accessories, it had been very hard! I was a victim of a storm that came in 2011 here in Warner Robins, GA. I once owned my own mobile home, but due to the storm, the tree fell right in my baby girl's bedroom and split the trailer in half. It left us with a non-livable home. I didn't have homeowners insurance at time and everything I ever worked hard for and bought was ALL gone and that left my baby girl and I VERY heartbroken. Red Cross stepped in and helped us with motel expenses and food. I was working at a chicken plant at the time on third shift and had to take 2 weeks off of work due to this tragedy. After that, I applied for public housing and they called me back after 6 months and offered us a 2 bedroom apartment. I now have 2 kids. An 11 year old daughter and a 4 year old son. We now have hardly any room due to small public housing. My children and I share the same bed, but it has been such a blessing to live there after tragedy hit our family. Although we are grateful for having a roof over our heads, the area we live has now gotten worse with fighting and gun shots in neighborhood. I don't let my kids play outside due to so much bad things in this neighborhood and I don't think it's fair to my kids. But me as their mother will ALWAYS keep them safe and happy. I haven't been able to work many hours because of my kids schedule which has made things even more complicated! Most recently, I was having a conversation with my mom who suggested that I apply for a Habitat home. And the first thing came to my mind is why would they pick me? The thought of being blessed with a home to call mine and having an opportunity for a new beginning just sounded way out of reach, well at least I thought so! God made me have FAITH and showed me to never give up FAITH for HE is KING ALMIGHTY and nothing is more powerful then HE! Since learning the news that I was selected for a brand new Habitat home, things have been on the up and positive for me and my kids. I vow to never give the devil joy at seeing me weak and full of doubt! God has answered our prayers. I will always remain humble and thankful and know that our God is always there when you call him at all times. No matter how bad a situation seems, God will lead you to the right path. And every day, when my kids and I awake, we thank him FAITHFULLY along with our prayers!!!! AMEN"
Houston County Habitat is so grateful to all of our volunteers, sponsors, donors and the City of Warner Robins Community Development Block Grant for helping to bring life changing opportunities to families in Houston County. We appreciate your giving spirit to help those seeking to build strength, stability and self-reliance through shelter.